Place 2 6" souffle dishes on a baking sheet and place into a 425 oven to preheat. During this time either by hand or blender, blend first 5 ingredients until just mixed. Do not over mix or Bunny will not rise. Add flour and combined until just mixed. If using a blender use the pulse until all flour is incorporated. Let the batter sit for at least 10 minutes for the flour to soak moisture before baking. When batter has sat for at least 10 minutes, pull the souffle dishes from the hot oven and place some butter into dish and with a brush (silicon if you have it) coat the inside of dish on all sides and bottom. You will need to coat the sides of the souffle so batter can rise, so carefully toss some powdered sugar so that the sides are covered. Do not worry about getting powder sugar on the bottom of the dish. Divide batter between the two souffles and place back into oven without the baking sheet. 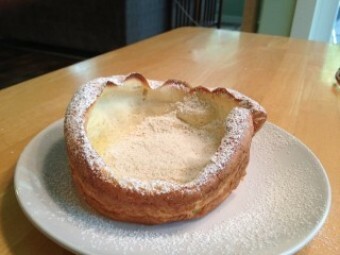 Serve with butter, fresh lemon, more powdered sugar and jam if desired.